We offer a full range of deck staining services and fence staining services! Protect your deck and bring out its original beauty with our deck staining service. The certified wood care specialists at Everseal will clean your deck and stain & seal it for a beautiful, protective finish! Let the experts at Everseal bring your fence back to life, with our professional fence staining! A fresh coat of stain can protect and seal your fence, while restoring its elegance! View photos of staining projects previously completed by Everseal. Everseal is a family-owned and operated deck and fence staining company which services the St Louis County and St Charles County areas. We specialize in the proper preparation and application of stain to revitalize and protect your deck or fence. Whether it's making your deck look new again or restoring your fence's beauty, we have the expertise to do the job right. 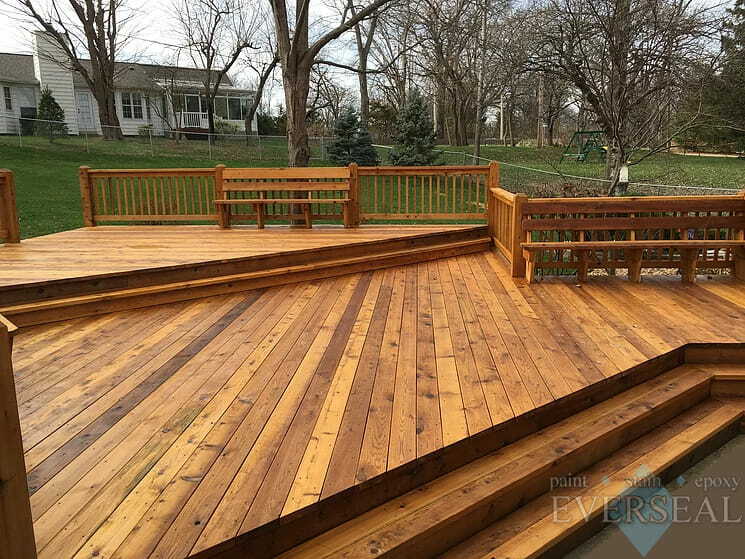 Everseal is a highly-rated, locally-owned small business that strives to be the best deck staining service and the best fence staining service in St Louis! We only use the highest quality products, so that each and every project we complete looks its best! With over 15 years serving the St. Louis area, Everseal is a highly-rated deck staining and fence staining contractor that is recommended by some of the largest builders in St. Louis. We use only the highest quality stains, all of our applications are completed with an attention to detail, and our services are both affordable and convenient. We look forward to providing you with a hassle-free estimate. Give us a call today! With many colors and opacities to choose from, we will help you find the right one to make your project perfect! Click here to view the available colors from Cabot Stains.